Julia’s little brother doesn’t know how to behave at a tea party. It’s time that changed. Julia will show Charles that slurping and burping are not allowed, that teacups are not building blocks, and that underwear does not count as a fancy hat. Charles will teach Julia that tea parties sometimes require deep breaths, and welcoming unexpected guests, and that maybe–just maybe–there is more than one way to properly behave. 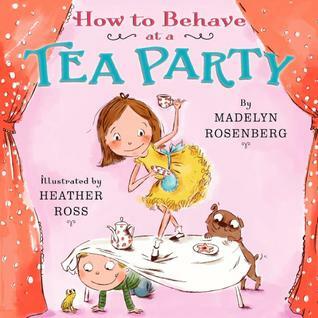 Julia invites her brother, Charles, to her tea party, but when his friends show up along with the dog, who wants to eat the peonies, and a frog that jumps in the teacups, the party becomes a disaster. No one is listening to an increasingly bossy Julia and, in frustration, she yells and sends them all scurrying away. But you can’t have a tea party without guests, so Julia tries again and re-invites her brother and lets him bring his friends. The book is only 32 pages long with cute and often humorous illustrations. There is not a lot of text with only a sentence or two on each page. The book is intended for preschool children and beginning readers. Besides teaching etiquette and manners, Julia also learns tolerance and acceptance of others. And, I suppose, a glimpse of what it’s like in the real world. I would have liked it a little more if it taught the same lesson without using stereotypical ‘girl’ behavior vs ‘boy’ behavior. Yeah, we need to get past stereotypes, especially in books for youngsters. Still, this book sounds cute! This sounds cute, but the stereotypes would bother me a bit as well.